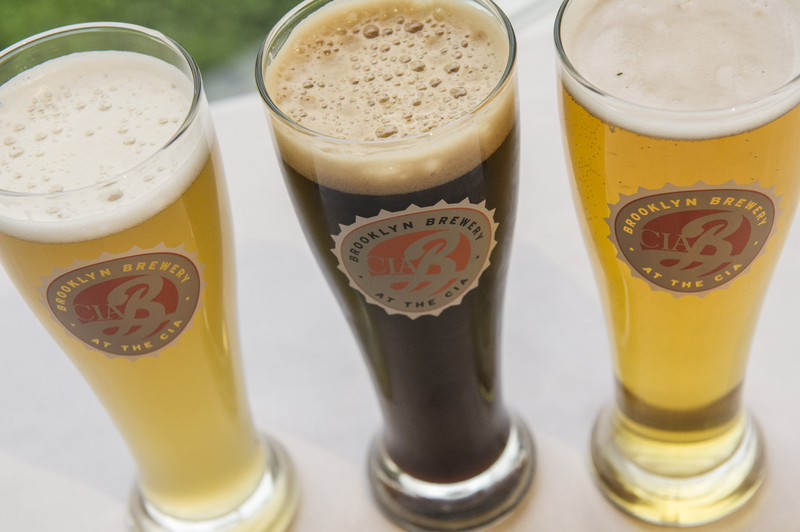 Hyde Park, NY – The Culinary Institute of America has introduced the first three beers brewed on campus as part of the college’s new Art & Science of Brewing elective. 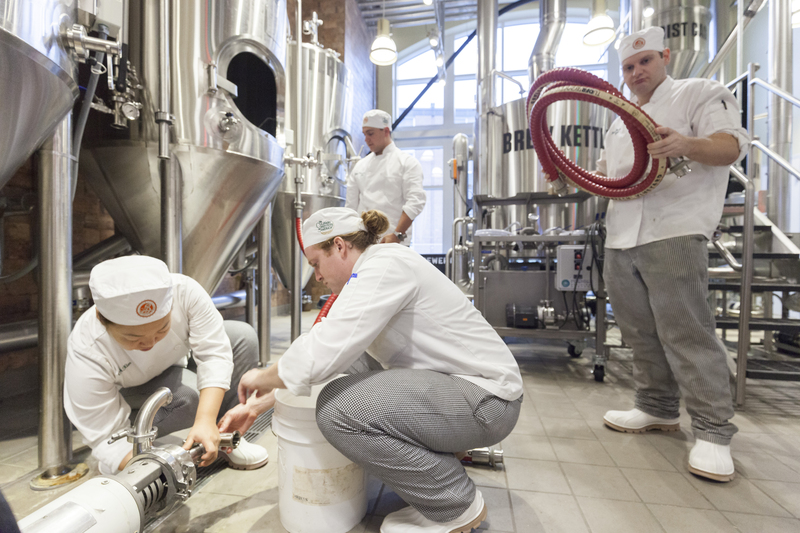 The course, part of the CIA’s bachelor’s degree offerings, is held in The Brewery at the CIA—a facility made possible thanks to a partnership between the college and Brooklyn Brewery. 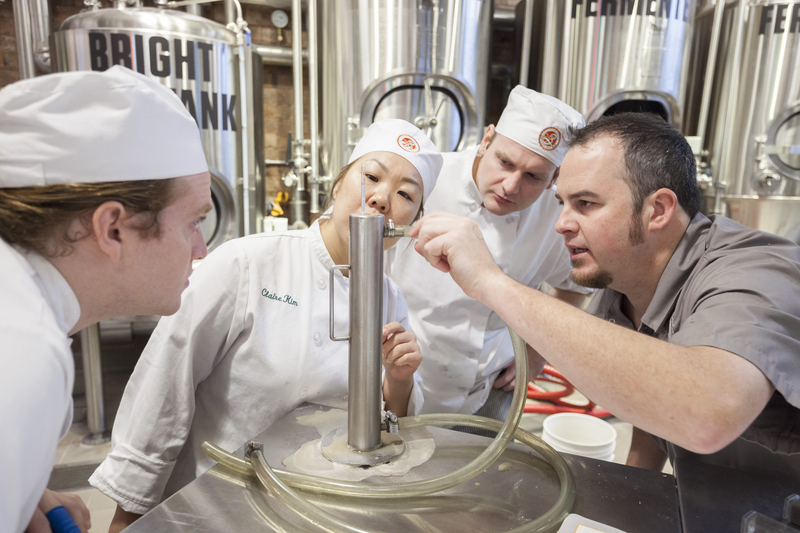 The course and the brewhouse built to house it were created to help elevate the status of beer on restaurant menus and familiarize the future leaders of foodservice and hospitality with how beer is produced. Beers brewed by students in the class will soon be available at the college’s public restaurants and in its new Student Commons. The brewery has begun producing two flagship brands, Cleaver IPA and Mise en Place Wit. In addition, The Brewery at the CIA will be producing a rotating lineup of “Class Project” seasonal beers designed and inspired by students in the Art & Science of Brewing course. Cleaver IPA (6.7% abv). 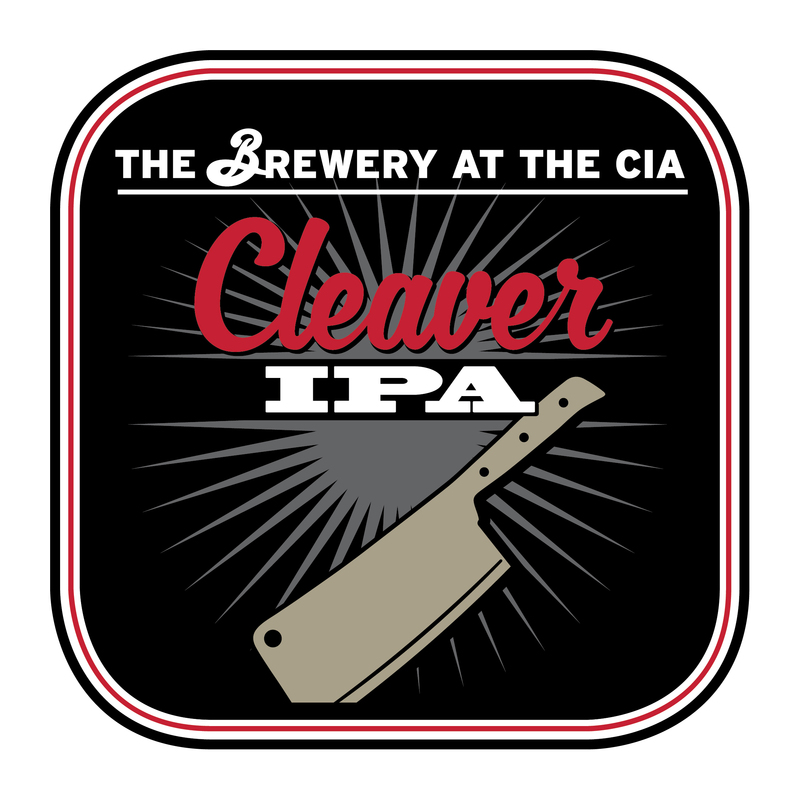 Cleaver is a golden-colored India Pale Ale featuring robust American hop flavor and aromas. Centennial, Mosaic, Amarillo, and Simcoe hops provide firm bitterness and huge hop flavors reminiscent of grapefruit and apricot balanced by a pleasant malty sweetness. The Brewery at the CIA added more hops directly into the fermentation tank (called “dry hopping”) to add an additional layer of bright fresh hoppy aroma. Mise en Place Wit (4.6% abv). 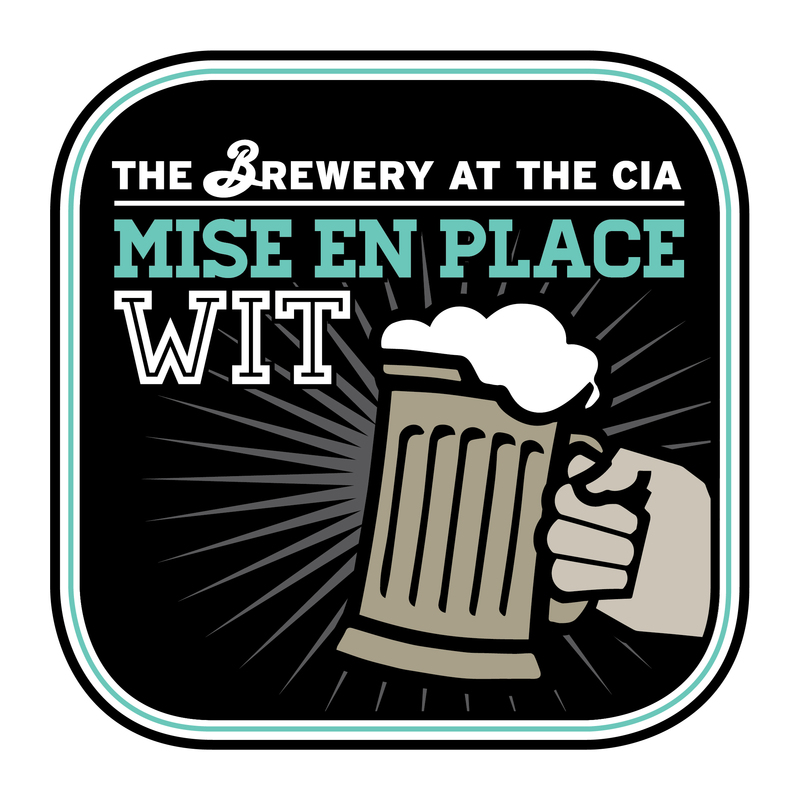 Mise en Place is a Belgian-style Witbier brewed with a large dose of unmalted white wheat and American two-row barley. Light-bodied and pleasantly spicy, this wheat beer is served unfiltered and brewed with orange peel and coriander. The CIA uses yeast strain from Belgium to add an additional layer of fermentation esters—fruit and spice flavors naturally produced during the fermentation process. Class Project Cast Iron Stout (5.8% abv). Class Project Cast Iron Stout is an oatmeal stout with a rich roasty malt body and notes of chocolate and espresso. This stout uses two types of oats as well as a blend of roasted malts to yield a dark black and full-bodied beer with a thick tan head that isn't heavy and filling. A nice dose of German Magnum and Perle hops adds some bitterness to help accentuate the “dark chocolate” flavor of the beer and provide a faint hoppy aroma. The Brewery at the CIA was designed and built by JV Northwest of Canby, OR in partnership with Brooklyn Brewery. The three-vessel, steam-fired stainless steel brewery features a separate mash mixer and lauter tun to allow for step mashing. With three cylindroconical fermentation vessels and one brite beer tank, this seven-barrel system is designed to yield 217 gallons per batch, or 1,736 pints. The Brewery at the CIA will be capable of producing up to 500 barrels of beer annually. The beers from The Brewery at the CIA are currently available in the American Bounty Restaurant. The other CIA restaurants on the New York campus—The Bocuse Restaurant, Ristorante Caterina de’ Medici, The Apple Pie Bakery Café, and Pangea—will begin offering the beers later this winter. For more information about the Art & Science of Brewing and Fermentation elective at the CIA, please visit us online.